There will be no extended explanation for this operation, as you are all likely aware of the Hegemony's recent activities. The basics: in addition to the ongoing Census (http://battlelog.battlefield.com/bf3/forum/threadview/2955065248805546539/), [battlelog.battlefield.com] the Hegemony is now commencing a sweeping archival of the best Forumfield has had to offer us over the years. We ask of all users, once again: take screenshots or of any and all worthwhile parts of the forum (No friendlists, please, but platoons are fine) from any point in time, and post them here! I will save all relevant files and carry them over to the new forums, so that the glory of our residence shall never be forgotten! The Hegemony's resources are limited; this is only possible with the community's help--therefore, Forumfielders of the world, unite! Obligatory TL;DR, as per Internal Regulatory Action 19: Please post any screencaps you have or want to make of memorable posts on the forums, or of special platoons. Links to youtube videos are also good, as long as it is something that can be posted in the new forums. 7th in World for Most Sniper Kills on PS3. Derp 4 life. Unfortunately most of Forumfield's greatest moments are hidden behind a wall, much like Sharp's post. Can we just bury the horse and move on? How about we bury a time capsule? You don't have to contribute, good citizen. Everything's going to be ok, for I am here. Indeed. It shall be saved. I am also recording the Adventures of the Poolshark. 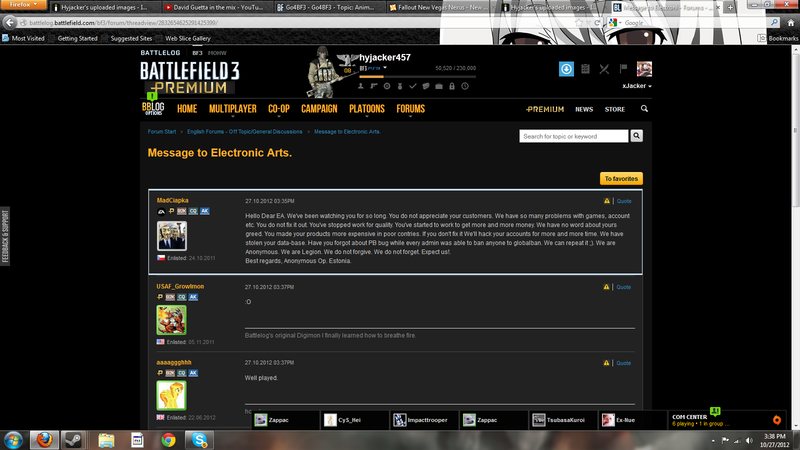 I may also save both BF3 and BF4 forum versions. Haha, my nick came out of that thread. ''Of all the wonders that I yet have heard, it seems to me most strange that men should fear, seeing that death, a necessary end, will come when it will come'' Some Italian dude. I was a huge fan of Battlefield 3 but then I got tired of cooling it. so perfectly perfect in its perfection. Many links, is too much, i'm lost. you have to be smart, observed and put your thoughts when necessary, otherwise there is anarchy. the reason to the moderation forumfield. Don't let it die yet! Last day, everyone! I would take a pic of that thread that was just posted, but i doubt that will end well. Instead, I will post this ancient gem i found stored away in my photo library. "Lock the doors, close the blinds, because its fapping time!"